The Italian ski resort of Alpe di Pampeago is blessed with exquisite natural beauty. Sitting among the peaks of Latemar, this Unesco ‘World Heritage Site’ is the perfect spot to hit the slopes. Here you’ll find vital information on the Alpe di Pampeago ski resort as well as help and guidance in booking your transfer. 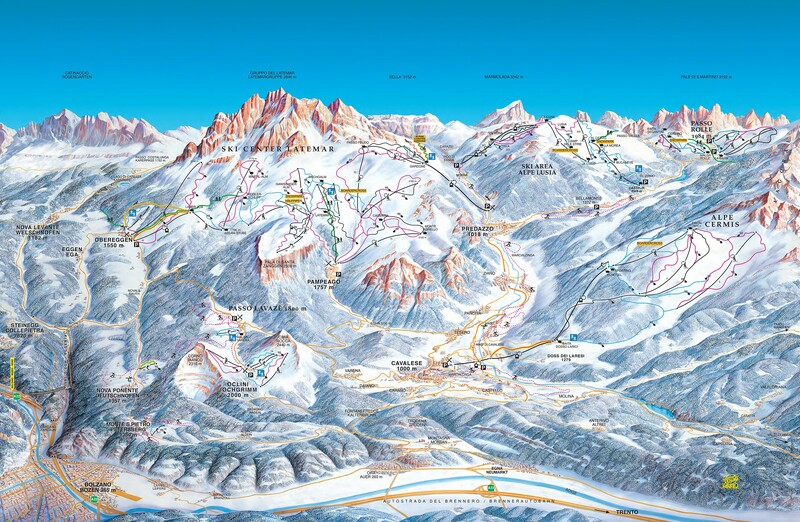 Alpe Di Pampeago is one of seven ski resorts within the famed Val di Fiemme Ski Area. Sitting upon the ‘sunny side’ of the Dolomites, this resort is situated among the Latemar mountain range, recognised for its spectacular views and favourable position for late snow. Latemar is the westernmost mountain range of the Dolomites. Sitting between South Tyrol and Trentino, it’s a popular destination for adventure lovers all year round. When visiting Alpe Di Pampeago, the closest towns will be Tesero (7.km), Cavalese (12.1km by road), Predazzo (16.6km by road) and Moena (26.4km by road). We take a dynamic approach to our pricing structure. This means we won’t just offer you a flat rate quote to and from Alpe di Pampeago, we’ll take into consideration the circumstances of your journey too. Despite being cheaper than our competitors – we still offer you the best possible deal! All of the above will only ever result in our base-rate for ski transfers going down – we never over-inflate our prices at any time or for any reason. We also offer substantial discounts for off-peak, off-season and midweek transfers to Alpe di Pampeago. If looking for the best possible deals, travelling outside peak season or midweek typically results in the biggest savings. We offer midweek (Monday to Friday) prices with up to 60% discount than weekend prices. Alpe di Pampeago sits at 1,750m with pistes/trails from 1,760m to 2,420m above sea level. Alpe di Pampeago is a great destination for intermediate and beginner skiers as well as those with families. Alpe di Pampeago, along with the wider Latemar skiing centre, is an ideal winter trip to take with the kids. There are plenty of designated child-friendly facilities and entertainment. The slopes are well groomed, wide and easily accessible. Highlights for families include Brunoland in neighbouring village Obereggen, Yeti’s children’s area in Obereggen and Bip Club children’s area and kindergarten in Alpe di Prepeago. We’re the lowest cost airport transfer provider that covers Alpe di Pampeago with private transfers. Our vehicles are based at the departure airports ensuring we’re the lowest cost, most reliable and most punctual transfer service for the Italian resort. Book online with us to guarantee the fastest, most efficient and lowest cost transfers. If you request a service or destination which is unavailable, get in contact directly and we will do our best to help. We operate at the lowest cost possible without compromising on service, reliability and safety. Start and end your trip to Alpe di Pampeago in the best possible way. Book your transfer here.